Four years before beginning to work on his Four Quartets, in a letter to Stephen Spender, T.S. Eliot wrote of Beethoven’s quartet in A minor, “I should like to get something of that into verse before I die.” Two yea rs later, in a lecture on Keats and Lawrence, Eliot remarked that his aim was “to go beyond poetry as Beethoven, in his quartets, strove to go beyond music.” The link between Eliot and music is certainly a strong one – Eliot’s own use of aural imagery seeming, at times, to elevate sound above the reach of poetry, whose foundation on the slippery grounds of language dooms the written text to perpetual inadequacy. It was, however, Bach and Messiaen’s music this time that framed Roger Allam’s reading of Eliot’s poetry at the Sam Wanamaker Playhouse. The function of poetry readings in a society that has neither the patience nor the necessity for poetry has always been controversial. Philip Larkin defended the right of the reader to choose his own setting and rhythm, claiming that hearing implied an inability to grasp the finer subtleties of a poem: homophones, italics, divisions of stanzas; the listener is hindered from absorbing the true meaning of a poem by being dragged on by the pace the performer decides to apply. The unclear purpose of public readings, moreover, threatens to place spoken poetry either too far within the realm of performance to allow the time for the quiet introspection the art requires or, if as dry and intellectual as Eliot’s own reading of his works, confine it within the sterile surroundings of a conference room. It was at the intersection between reading and performance, that Angela Hewitt and Roger Allam’s staging of The Four Quartets should be placed. From the very beginning, it was evident that music was not going to be employed as an interlude between the different sections of the poem, but as a means of communication and explanation in its own right. Bach’s Prelude in C Major took the place of Burnt Norton’s opening epigraphs— two fragments on Logos and Movement that Eliot borrowed, untranslated, from Heraclitus. If- as it’s been widely argued– Eliot’s aim in providing the epigraph in its original language was t o highlight the existence of a thought untainted by modern logic and unyielding to Western science, a thought that could not be translated without being destroyed by the very act of translation, then the choice of opening the night with Bach’s music cast a light on the relation between poetry, which struggles to discuss what words themselves are unable to articulate, and music, with its ability to combine the purity of thought with the sensuality of experience. There was a refined precision to Hewitt’s playing of Bach which managed nevertheless to remain emotionally stimulating. The dazzling feats of mathematical rigidity which many interpreters are fond of displaying gave way to a controlled elegance, a moderate pacing, and a graceful vitality, giving the pieces new freshness and a clear emotional dimension. 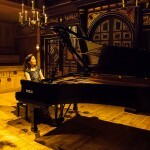 Even more compelling was her rendition of Messiaen: clear, well-defined melodic lines, fluid and unadorned dynamics, and an always perfectly unhurried tempo. 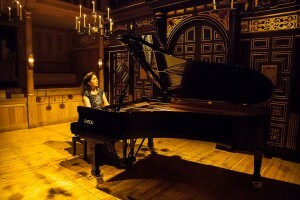 The emotional poise of her playing was at times offset by outbursts of extravagance expressed through ardent movements and emphatic gestures that added to the visual appeal of her interpretation. For two hours, words and harmonies merged and mingled in an endlessly spinning design of beginnings and endings; Hewitt and Allam proving to be not merely performers but the very means through which thoughts and meanings solidified into art and symbols. The whole night seemed to be built upon a fugal structure, with Hewitt’s piano ushered in to transpose each of the Four Quartets’ ideas into music whenever Eliot’s language seemed to slip and crumble in “the general mess of imprecision of feeling.” Music proved to be the translation of Eliot’s themes beyond the confusion of language, leaving the audience never at a loss as to the unity holding together Eliot, Bach, and Messiaen’s works: the search for a higher pattern, a hidden structure, a spiritual path. The Four Quartets is a notoriously complex poem- a philosophical essay, a spiritual journey, and a meditation all at once. Its carpet of repeated patterns, symmetrical verses and running passages combine in a seemingly disintegrating structure where it is easy to get lost or confused. Eliot’s imagery perpetually oscillates between time and timelessness, movement and stillness, symbols and meaning s, striving for a coexistence of contradictions that might bring about both “inner freedom from practical desire,” and the weaving of a poem capable of transcending the poetic form itself. And just as the beauties hidden in the strict form of Bach’s pieces are inseparable from their structure, the many ideas scattered through the whole of the Four Quartets are impossible to extricate from their own form: each section and each idea coherent on its own but meaningful and, indeed, illuminating, only when made to resonate against the wider frame of the whole poem. In Allam’s hands, words were never left unattended, the fragmented nature of the Quartets spoken into a coherent whole. Allam’s ability to crystallise intuition into comprehension imbued words with meaning and prevented the air from being filled with too much wordplay. 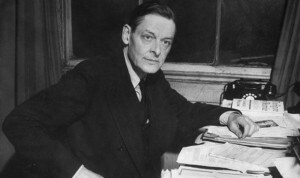 The infinite resourcefulness of his voice alerted the audience of the various enchantments of language— running passages, decaying structures, repeating patterns, the seduction of music made “Incarnate”– yet with an ease which, to use Eliot’s own words, was “cause of wonder.” His mastery of voice allowed him shifts in dynamic and coloration, rhythm and emotion, that let humour naturally emerge from the text and unfailingly singled out the dominant mood in the Quartets’ varying stages of thoughtfulness, wistfulness, cynicism, despair, and hope. Words were never thrust unto the audience without first being created— rhythms found, repetitions unearthed, weights and stresses balanced, nuances unveiled. I have just inadvertently found your website with the incredible information about an event that included my favorite poet T.S. Eliot and one of my favorite pianists Angela Hewitt. Was this recorded, and if so, is it available on disc? To date there is no recording for sale. 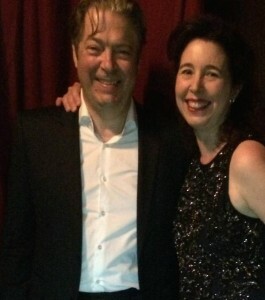 Angela Hewitt and Roger Allam performed together previously at the Trasimeno Music Festival (Walton’s Façade), and of course we’ll let you know if and when they share the stage again.